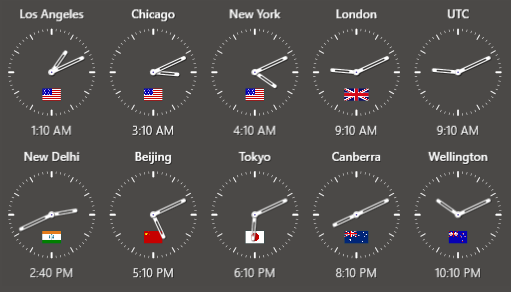 You see 10 analog clocks with an additional digital clock below the clock face. You can make them very small and also very big - there is no limit. Notice that the visual quality on your desktop will remain practically the same and the resizing can be accomplished steplessly! In the background the resizing is done in 3D and is hardware accelerated, using DirectX. The resize handle becomes visible on mouse-hover only. 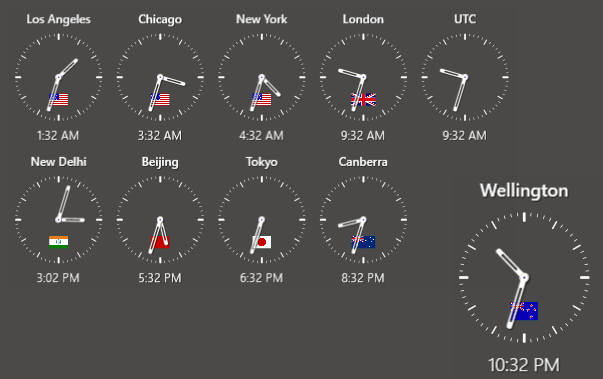 The normal way to display the clocks on your Windows desktop is to arrange them in in a grid array or in a horizontal or vertical line. You can change the nummber of columns with a slider, to make the appearance fit the number of clocks and the space you have on your desktop. For 6 clocks, you can for instance have 3 columns and 2 rows - or 2 columns and 3 rows - or just one horizontal line.